It's a pretty decent hostel. We had a great time there. I would recommend it to anyone. Great hostel! Staff was very nice and helpful! Room was super spacious! Free breakfast in the morning was AWESOME! Está muy limpio, el desayuno lo incluyen pero te tienen limitado, no rellenan el bote con leche a pesar de que lo ven vacío; los panesitos están ricos y otro punto no tan bueno es que te cobran si quieres usar la cocina €3. Fuera de eso esta bien. Esta como a 20 aprox caminando al centro, se llama fácil. The property is actually an apartment-turned-hostel. Check-in time is periodic, so you need to inform the hostel when you will be arriving. Had a hard time checking in when I arrived after 11.00 p.m. With no full-time reception, you might encounter problem getting back your left luggage after check-out. Rooms are conjested with a conducive living hall. Breakfast is just OK. There is only one shower room. Located close to a metro station with limited eateries around. You do the pick! Overall a nice place to stay. The staff is really friendly and they appreciate it a lot if you speak a little portugese :) The location on one hand is nice because it's pretty close to Anjos metro station but on the other hand it's loud during the night because of the traffic. Also, just one bathroom is a little challenge when the hoostel is fully booked but it's just needed to be a little flexible. In summary it is a nice place with a nice common area and nice beds. Would stay there again. 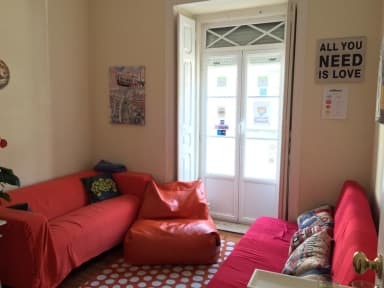 The hostel is in a great location, however there is a 2 euro charge just to use the kitchen and the free breakfast is very basic (bread, butter and jam). I found a bedbug on my bed and showed this to the manager. She did not seem to care and told me she had been bitten by something in that same bed a few nights ago. She only offered to clean my bedding, however did not ask if I would have liked another bed. Hostel was good, however too many rules. (can't use kitchen after 11pm). 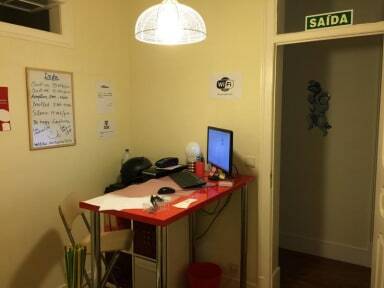 Good: Safe, close to a metro stop and some good restaurants (ramiro!). Breakfast and free wifi. Bad: The lady who runs it seemed nice but turned incredibly sour after we made noise trying to unlock a squeaky door at night. Afterwards, we felt awkward being in the hostel when she was home. If you don’t speak portuguese you’ll have a rough time. Small rooms, VERY subdued atmosphere— host is very sensitive about noise. Shower head almost fell on two of us, not safe. Have to pay to use kitchen. I can’t fault the hostel for everything, like the 2 euro tax I guess everyone pays. The hostel was 8 euro a night. Pitch black stairways, skinny doors, tight quarters, I mean not the best to stay. Charge for kitchen use, not that clean of a place, no staff around to help. 1 lady emails and wants to know what time you will arrive when I told her twice thru email and app. That’s the bad. The good was piping hot shower, good WiFi and cheap stay. Pick your battles. The property of the hostel is rude and she did bad things with us. The total value of the stay debited my account before check-in and debited fees after checkout without my authorization. I saw the debit my account and sent her a email asked about this and then she explain me. However, I disagree with this action because I didn't know what's reason it and I didn't authorize the debit.